Oh hey, Internets! Haven't been checking up on you in a while. 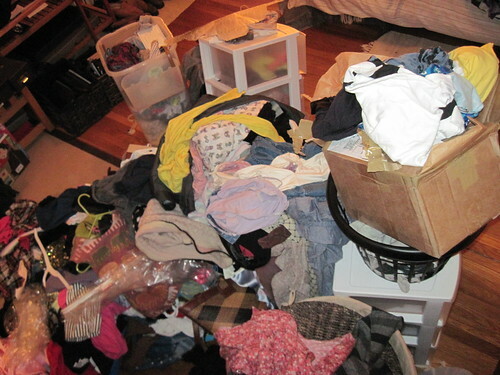 This weekend I was sort of busy moving 34058 tons of clothing into a new closet since there can only be so many baskets full of clothes scattered randomly across the house until you are immobile and tripping, a lot, all the time. Behold, Photo Documentation! Because I like to avoid real work and just stare at the Clueless/Olympics ceremonies on the pretty moving picture machine instead, and also take pictures of the stuff I'm supposed to be doing. AND THIS IS NOT EVEN ALL OF IT. BY ANY. MEANS. I have a problem. Is there a doctor in the house? tree fight from Spencer Tweedy on Vimeo. Ha ha, you crazy kids. And what did I do today? Because you care, obviously? Well, for a science project, I collected bacteria on the many surfaces in the school bathrooms using Scientific Technological Fancy Devices known as q-tips. This meant toilet seats! And? The best part? That I had to collect from the boys' bathroom, too. EW COOTIES. And? The bester part? A DUDE CAME IN WHILE I WAS COLLECTING BACTERIA FROM THE PAPER TOWEL DISPENSER AND THOUGHT I WAS ALSO A DUDE. So. That's, um, that. And aside from all this, what else did I do this weekend? Not blog, I'll tell you that! So I shall do so now, and catch up on Milan: Dolce and Gabbana. Um, I am too lazy to pick my favorites from 72 FREAKING LOOKS so here is the opener. It was definitely an extension from last season, though slightly more grown up (last season was kind of goth teenager at times, in a good way, of course.) Mostly I like that there wasn't really a hook, or a distinctive print that will make "DOLCE FALL 2010" spring to mind when I see it in a magazine: timeless pieces. And, like every designer and their mom this season, there was velvet. But it looked good! Draped velvet that didn't look like funky aunt condo upholstery! Bravo, men! Still, some people are saying this is like..the new "power-dressing" or something? I mean, some pieces definitely were for a strong lady and whatnot, but it was hard to tell what the dudes wanted to say when there were seventy-two freaking looks. There wasn't a "hook", and I think this was mostly a good thing - no gimmicks. But there wasn't a consistency either, and any kind of statement about power dressing was lost when differing silhouettes were somewhat arbitrarily thrown out in an order that felt pretty random. There was something somewhat indecisive about it, and while I'm not opposed to some interesting tension, it didn't seem deliberate when the individual looks were exuding confidence and sexiness. But the overall vibe of the show, if lacking cohesion, was classic Dolce & Gabbana. I mean, leopard prints! Black! Polka dots! Pencil skirts! Silk florals! Also, MOULIN ROUGE SOUNDTRACK! Epic! And actually, this gets me thinking, because I just watched the video on style.com after writing this, and it seems like the show was actually really moving, and everyone there was crying because there was a video in the background of Stefano Gabbana and Domenico Dolce actually making the clothes. And that's quite a nice idea; the dialogue between the designer and the clothing is very personal. My reaction versus the reaction of the people speaking in the video reminded me of what Suzy Menkes recently said about how a collection can't be reviewed if the writer wasn't actually at the show. I sort of disagree - I mean, if I had been at the show, I would've seen the video and heard the soundtrack and been in a room full of crying people before writing what I thought about the collection itself. While the show certainly helps the designer convey their message, it's also sort of jading, because you're given preconceived notions as to what you're supposed to see. I'm thinking out loud here, so bear with me. But really, it is just about the clothes themselves, isn't it? And what they can convey on their own, without music, and a set, and hair and makeup? How important is presentation? Hm hm hm. What do you think? I'm curious. Marni. Every season Consuelo Castiglioni and Lucinda Chambers somehow makes totally grandma-style stuff just work and come with a sort of coolness and effortlessness. I think the breezy attitude was supposed to make its mark with oversized tops, but in some cases ended up looking too boxy, or stuffy, or drowning, or awkwardly-fitted and frumpy. And like, I love awkward fitting! AND frumpy! A lot! And also clothes that drown the wearer, because I like being a hermit! But for some reason I couldn't get with it this time. Other than that, and one dress that was maybe a bit too similar to that Margiela get up, I loved it. 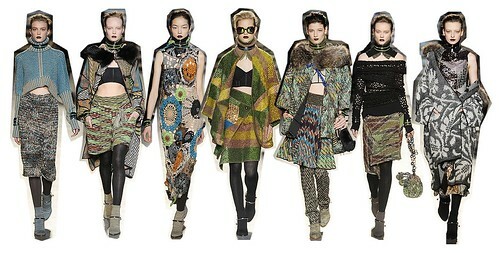 I usually do love Marni. There were, as always, epic prints and colors. 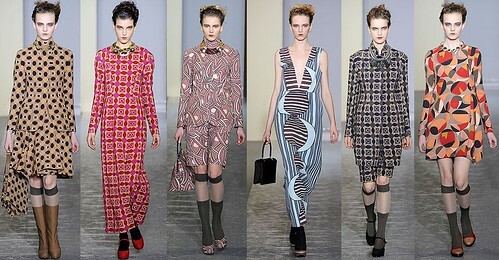 Marni always, always does wonderful colors! The breeziness (this is starting to sound like a goddamn Covergirl commercial, my God) still found its way in by the end, with sheers and low cuts and slivers of sequins and relaxed color palettes. Missoni. Okay, there was seriously something really tingly and exciting and awesome in the zig zag-printed water coolers at the Missoni offices this season because WOW. They've been going in a wonderful new direction since Vanessa Reid became the stylist but I think for a couple seasons the styling was more to credit on account of mood of the collection, more so than the actual design. This time we got a nice balance. The doily dresses (to be worn with Rodarte doily top, obvz) and giant blanket ponchos are nomadic on their own, especially with a sandier, darker color palette (not a cooler one, necessarily-just darker. I picked here the looks I liked the most, but there were warm colors too. I am just really drawn to greens and blues!) World traveler, right here, but with a certain sumptuousness. I don't think there is another fashion house that can spell out luxury in free-spirited clothing in quite the same way.